They’re the segment marketers need to attract despite the fact that, as a group, they don’t have as much economic power as their older counterparts. Yet millennials are highly educated, technically savvy, and concerned about the world around them. 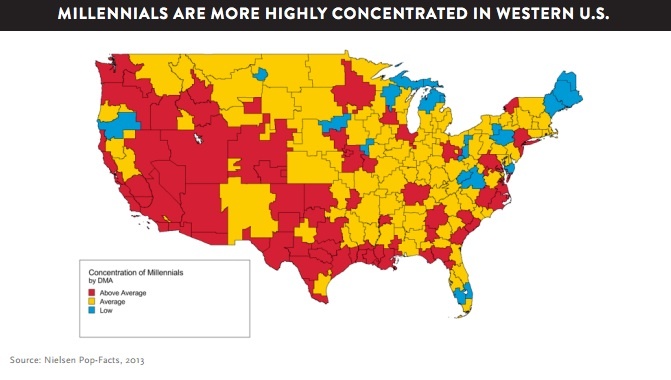 Millennials tend to concentrate in the western US (as well as Washington DC). This growing population will drive demand in these areas. Millennials are moving across the country from their boomer parents. By contrast boomers tended to flock to the east coast. 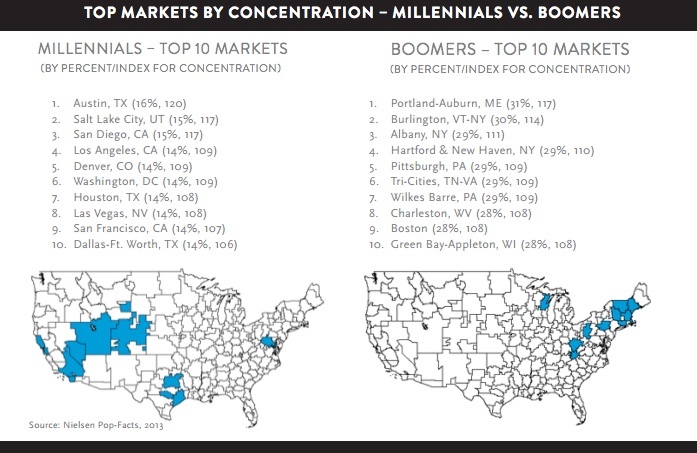 Looking at the top 10 markets for millennials versus boomers, it appears that children are moving far away from their parents. Actionable Marketing Tip: Understand the westward movement away from the East Coast. To appreciate their millennial sensibilities examine cities like Austin. 62% of millennials prefer urban areas to the suburbs and beyond. This is contributing the higher growth rate of cities over non-urban areas for the first time since the 1920s. This a factor in the rise of “New Urbanism“, specifically creating areas that are culturally diverse, with pedestrian walkways and public transportation, parks and different types of housing. Among the cities exemplifying the New Urbanism are Miami, Memphis, San Antonio, Portland and Jersey City. 40% of millennials plan to live in urban areas in the future. Millennials are more likely to walk to work in line with their desire for pedestrian friendly environments. Actionable Marketing Tip: Focus on urban areas to reach millennials. This has broad implications for housing, automobiles and other products. This demographic will need products that work in an urban environment. Think apartment living. Two-thirds of Millennials rent. They live with others, either roommates or family members. They were hit hard by the recession. 31% of millennials lived with their parents in 2010, up 6 percentage points from 2005. Actionable Marketing Tip: Enable millennials to express themselves with home amenities that lend themselves to short term living arrangements. Think transportable. 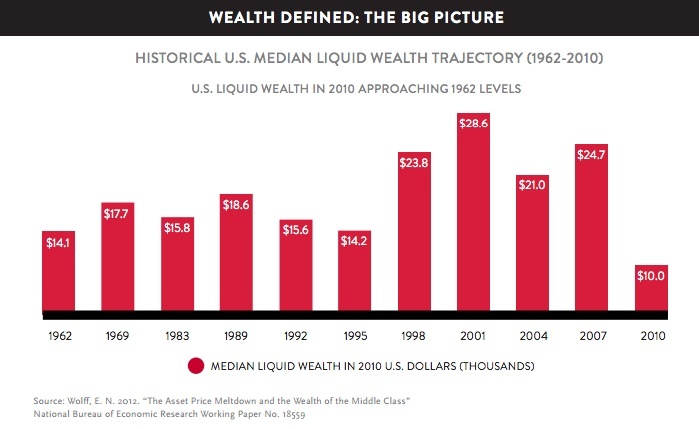 Younger millennials’ median household income is $24,973 and older millennials’ median household income is $47,854. 36% of millennials get financial help from their parents. 66% of millennials under age 25 owned a car, down 7 percentage points from 2007. They’re more likely to own electric or hybrid vehicles in line with their concerns about the environment. From a financial perspective, while millennials are highly educated, they have student loans to pay off. Due to coming of age during the recession, they’re more like their Greatest generation grandparents. They’re more austere and money conscious. In terms of banking and investments, millennials prefer to handle their finances on their own. They’re less likely than their parents to have contact with a financial advisor although this may be due to the fact that they don’t have sufficient funds to invest. Millennials are the heaviest users of online banking. Further, they tend to use debit and ATM cards in lieu of credit cards. This may be attributable to their low income. Actionable Marketing Tip: Adapt your financial offerings to be mobile and online accessible to service millennials the way they want to interact with financial institutions. 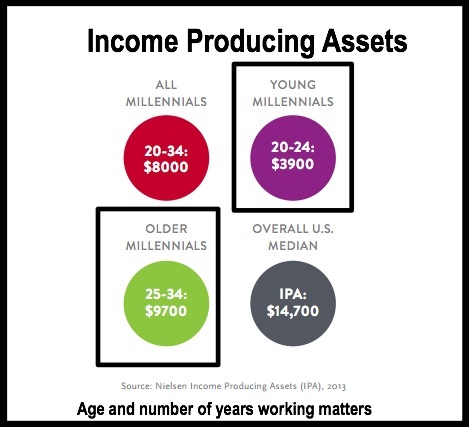 Millennials account for 14.7% of people with over $2 million in assets, just behind their Boomer parents. This is attributable to startup and entrepreneurial activity. 8% of Millennials have their own businesses. 2.5 million millennial households have over $100,000 in income. 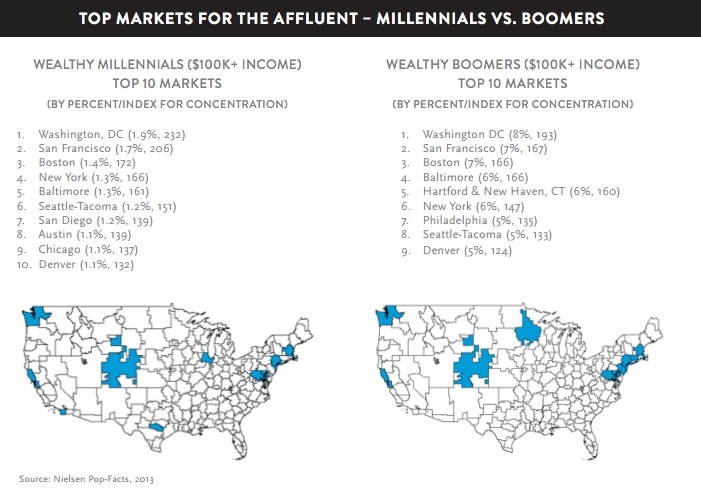 San Diego, Austin and Chicago have higher concentrations of wealthy Millennials than Boomers. These cities are centers for the “Creative Class”, knowledge workers, intellectuals and artists who value artistic expression, education and knowledge. Actionable Marketing Tip: Don’t assume that all millennials have limited financial means. They account for a good proportion of people with large assets. Further, they tend to entrepreneurial. Millennials don’t like old school marketing. They’ve grown up with computers and select the information they need online and on social media. Millennials tend to be cost-conscious. This may be attributable to their relatively lower income and higher debt (in the form of student loans.) As a result, they tend to buy at warehouse clubs and other less expensive stores. 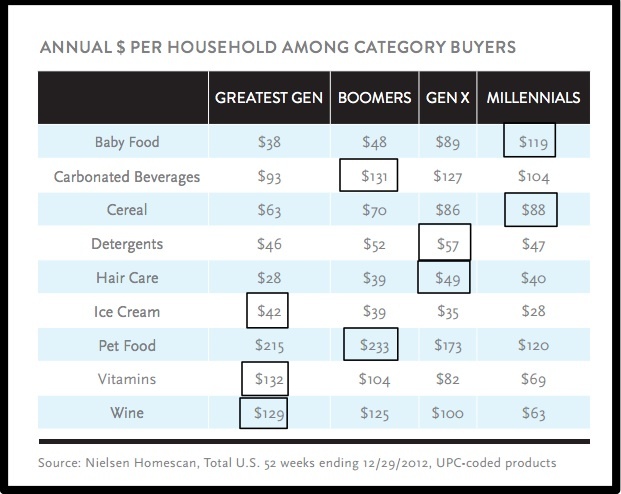 Given their age, what’s interesting is millennials’ relatively lower spend on carbonated beverages (aka soda) and wine. Their healthy lifestyle is shown in terms of higher cereal costs and lower ice cream costs. Actionable Marketing Tip: Adjust your product offering to meet millennials’ buying behavior. They’re budget conscious as well as environmentally aware. 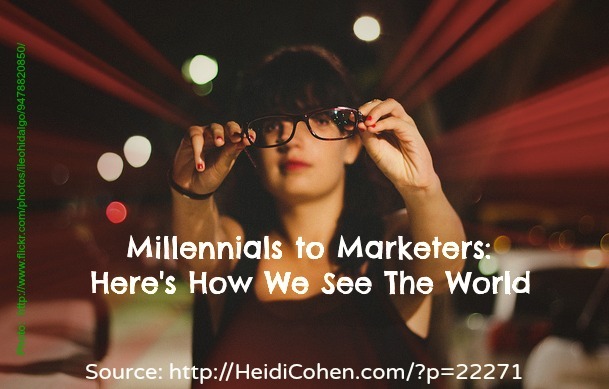 Marketers need to understand millennials in order to be able to reach and engage them. This means appreciating what distinguishes them from their boomer parents and what makes them tick. Millennials are value conscious urbanites, who in many ways are more like their Greatest generation grandparents as a result of the recession. Yet they march to the tune of their own technological drummer. How have you adapted your products and marketing to meet the needs of millennials? 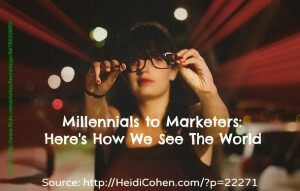 If you’re a millennial, what are you seeking from marketers? Tags Millennials, Nielsen. Bookmark the permalink. Great statistics! I wrote a blog about being a millennial in a world where older generations think we’re lazy and entitled. It’s a blog about why I think they’re wrong about us. Really valuable stats and insight on the millennial generation, Heidi! 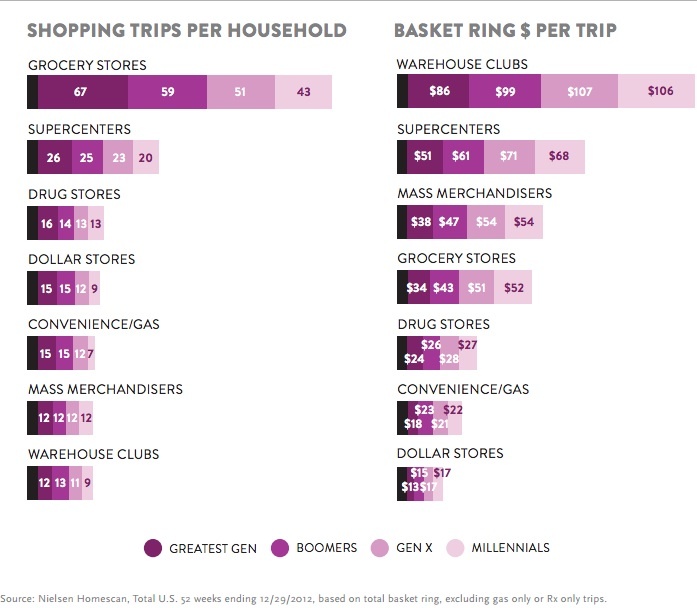 I do think some millennials are cost conscious, but I agree that they also do spend beyond their means. Credit cards offers are really accessible. Millennials desire material possessions, travel and experiences. Social media only propagates this, though it doesn’t always tell the full story and expectations are a bit delusional. Sarah–Please note that these insights are based on research from Nielsen. They use a very large demographic that spans over 20 years. As a result, there can be distinct differences. Also, millennials getting financial support from their parents may use their parents’ credit card. Happy marketing, Heidi Cohen. The biggest reasons millennials (myself included) tend to be cost-conscious is that, as you said, we’ve reached working age at the same time as the global recession. This contributes to the drop in drivers, too – especially in countries where you don’t learn at school, and lessons are incredibly expensive. I’m based in Europe, so many of these statistics don’t necessarily apply to where I work. I would say that millennials over here are similarly inclined to urban areas, though! In London, many of our early adopters are millennials. I think that’s at least partially because I work for an online networking startup – as you said, millennials are trendsetters, and after Facebook, Twitter, Instagram etc, I think many of them want to jump onto new networks early. But it’s interesting to note that based on the data, millennials are running up debt for things that are beyond their means.